Who’s ready for a Writers Festival? Here’s a bunch of faces you’ll be seeing about in the coming days, all excited to meet you in just a handful of hours! 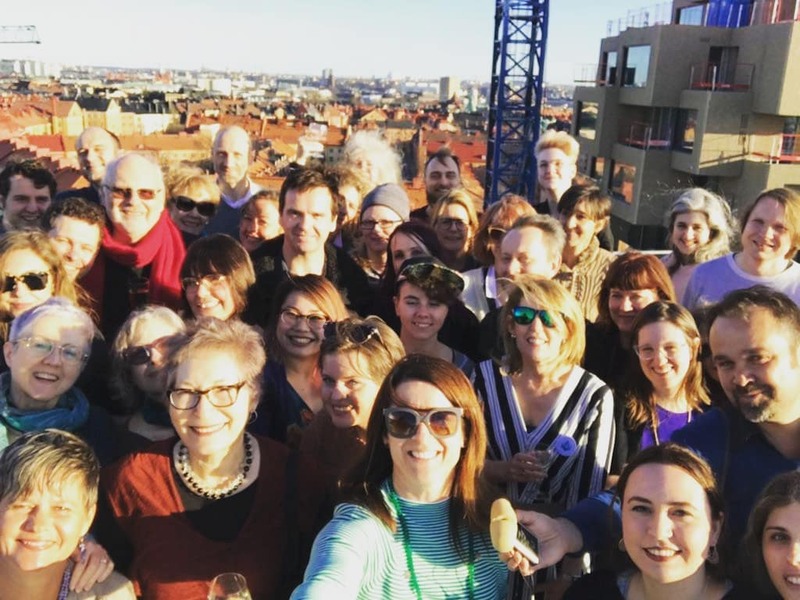 Thursday afternoon, April 12, was the kick-off mingle for helpers and faculty at SWF founder, Catherine Pettersson’s incredible new apartment. There were lots of home-made baked goods on the kitchen island along with different colors of wine, and Catherine’s son Victor knew to fizz the water with lots of CO2. Fuzzy beer was available on the rooftop terrace. And while the apartment was pretty cool, it was the people I had a chance to meet and talk to that made the evening. I got to schmooze once again with Cat’s rat pack of incredible people who helped her shepherd her idea to reality; Lizzie Harwood and her Mickael were there, as were Elizabeth Clark Wessel, Sandra Carpenter, Susan Wuest, Sarah Hollister, Kendal von Sydow and Adnan Mahmutovic. I got to talk sci-fi with Paddy Kelly. Met Eira Ekre again and her guy Dan who I spent a lot of time talking to about cool virtual reality stuff. I chatted with faculty member, Paul Rapacioli, from The Local. He was interesting and funny and also tall so I didn’t have to talk to him while scrunching down. Always a plus. I talked with the charming Clydette de Groot who together with her husband, Charles, sponsored the Festival’s First Pages Prize. I met (and talked with) Adam McCulloch, the winner of the First Pages Prize, who traveled here all the way from Mexico. Another of the Faculty members I had a chance to meet was Brooks Sherman and his wife, who came all the way from the US but via Italy so he wasn’t too jet lagged and seemed really excited to be here. 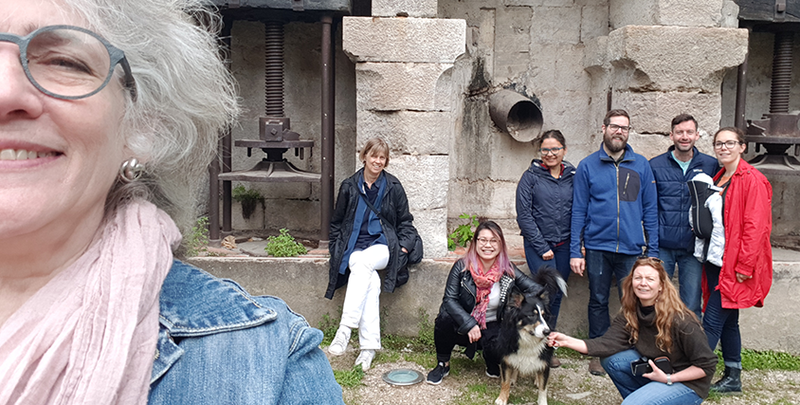 There was a chance to once again meet the wonderful group of young people (yes, Ting Yiu, you are a young person) from the Stockholm University Masters program in Transnational Creative Writing who were going to be the helpful volunteer facilitators at the festival. There were many more there that I wanted to talk to but it was impossible to talk to everyone when there is so little time and so many great people. I knew I would see them later on Friday and Saturday. And I also got to reconnect with my dear friend Amy Brown (who abandoned me and Stockholm, to move to the sunny shores of Florida) and her cuz Elinor Lipman (keynote speaker) who was lots of fun to talk to. Amy, Eli and I went and ate dinner together afterwards with our friend Carol Henderson. A Writers Festival? But I’m a graphic designer! It all started for me on Tuesday, 9 May 2017, (a whole year ago in case you didn’t catch that) in an Expresso House where I met with Catherine to discuss helping her with this writers thing she was doing. She knew I did graphics (and was also interested in writing) so she wondered if I could offer her my graphic designer help. It sounded like fun so I said yes. Catherine can be very persuasive. She had already found a logo for the festival – I just helped make it more usable. I did a quick proposal brochure for her to show around. During the following months I made a few ads and the odd graphic here and there when needed until it was time to start work on the festival program brochure. Lizzie Harwood’s husband Mickael Gohier, Marketing Director for the Antalis paper company, was donating some very hi-tech paper for the back cover of the program. It had a computer chip embedded in it that when programmed would lead your smart phone to the comments page on the Stockholm Writers Festival website. I got to join Mickael and Catherine at the printer’s to watch the back page being printed and to test how it worked. It worked great! We also printed up business cards on Antalis donated paper with embedded chips leading to the SWF website. So cool – combining old tech with new tech. OK, so it was Friday the 13th, but what a great day anyway! And it was sunny! Registration opened at 4pm at the Berghs School of Communications. Berghs generously donated their facilities for the festival. I got my nifty festival bag with a bunch of goodies and my name tag! I schmoozed a bit with people I knew and some I didn’t, till we were all called in by the clanger to take seats around the round tables in the Berghs Auditorium. Catherine was on the stage, dressed in a fantastic coat covered in images of Stockholm. One of my pet peeves (I have many) is people who speak in front of an audience and don’t know how to do it; who talk into their papers, who don’t enunciate clearly or speak too fast or too unhearable, people who quite simply don’t know how to take control of their audience. Catherine isn’t one of those. She is a natural on the stage, funny, authoritative and clear, and she belongs up there. Then Lizzie and the de Groots announced the winners of the First Pages Prize and gave awards to the first and second prize winners who were brought here for the festival. Adam McCulloch won the first prize and Kristy Keller won second. And then the big crowd of attendees rearranged themselves into their genre tribes. I joined Lizzie Harwood in the tribe of Memoir writers. We all sat together bonding over what we each wrote about. Yes, I’m beginning to think I belong here. And so it began – 8am registration. I got there at 8.30 because I was already registered. The coffee was very strong – and needed. The clanger started ringing and we all got summoned to the auditorium. A panel discussion about the state of the publishing industry, moderated by Paul Rapacioli with the guest editors, agents and publishers; Terri Bischoff, Rebecca Carter, Amy Cherry, Peta Nightingale and Brooks Sherman, started the day off. Then on to the first breakout session. I had chosen to listen to Julie Lindahl talk about memoir: Writing from past pain. As a Jew with a grandparent who lost family members in the Holocaust, listening to someone discuss how discovering rather late in life that her grandparents had been SS members and how that hidden past had affected her and how writing about it had helped her, was very enlightening. I wanted to talk more to her later but didn’t manage it. Then came 2 sessions of Buttonholing the Expert, a kind of speed-dating (with a lunch break at Urban Deli in between). I’ve never done speed-dating and I’m not really very good at rule-following so I decided to listen twice to Jess Lourey discuss editing hacks. Catherine, standing just above me on the stage saw me not changing tables and announced to the whole auditorium that I was not following the rules. Boy, what a bully she is! I didn’t move though. I figured I needed to know those hacks. I also went to Lizzie Harwood’s table and listened to her excellent advice on story structure. First, The role of research by Jenny White. She described how she used research for her trilogy of novels about the Ottoman Empire. 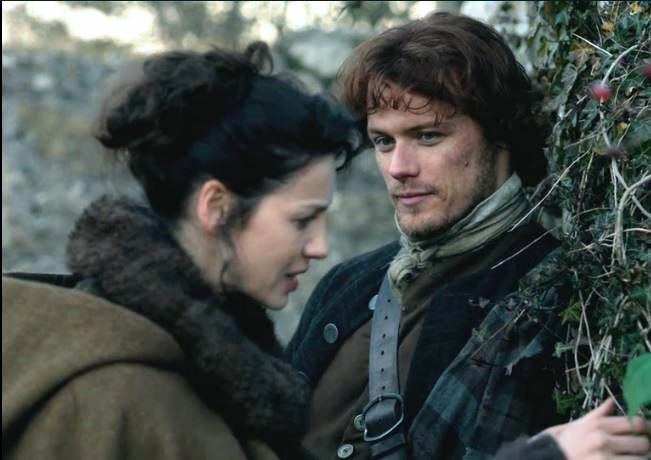 But Jenny is a star in my book because she told me when I had met her a few weeks ago that Diana Gabaldon had done a very nice blurb for her first book. Anyone who knows me or has read this blog already knows how I feel about Gabaldon and her Outlander books so I won’t get into that now. The third breakout session was about Subtext and lead by Cassie Gonzalas (my writing guru) and was great as usual. She has discussed subtext in some of the workshops I have taken with her before and amazingly enough I actually remembered some of what she has taught me. And she gave us a writing prompt to do – always fun. Midway in between bites of cookie, the clanger rang again bringing us all back into the auditorium to hear our guest writers, Katarina Bivald, Jess Lourey, Derek B. Miller, Marina Blitshteyn and Elinor Lipman, lead by moderator Sandra Carpenter, discuss how they kept on writing in spite of everything. Gee, even real, professional writers have problems writing (and tricks to get over it). Good to hear. And finally our Keynote Speaker, Elinor Lipman got up on the stage to talk about her writing process, one sentence at a time. As she spoke from her collection of index cards, she explained to us how she puts her books together with no advance formal outline. As I watched her shuffling through her cards, I realized that was the same way she wrote speeches too. She was warm, funny and very entertaining. A very good ending to a fantastic day. Together with my pal Amy Brown, her cousin Elinor Lipman, Editor Amy Cherry, Newsman Paul Rapacioli and publisher Peta Nightingale I went for dinner at The Queens Head, a nearby British style pub. I had Fish and Chips – what else! By 8pm we had rejoined the rest of the SWF18 gang at the Hotel Hellsten for the Literary Idol event in their glass-covered room. A variety of hors d’oeuvres and wines of different colors was there to sample. Elinor Lipman, Amy Cherry, Terri Bischoff, Brooks Sherman and Peta Nightingale sat as judges as Marina Blitshteyn read 1-page entries submitted by SWF18 attendees. If 2 or more judges raised their hand before the piece was finished, it was out. It was so interesting to listen to the variety of the entries and there were a lot of them. By about 10.30 the judging was over and it was time to call it quits. I said goodbye to new friends and old and left to come home. There was an additional series of Intensive Workshops scheduled for Sunday April 15 but they seemed to be more for those who are further along on their writing paths so I didn’t go to those. This has been my first and so far only writers festival so I have nothing like it to compare it to. But I worked in the conference field for over 15 years, making slide shows for speakers and I have been to a few of those conferences. And I will put this first time effort up there in the top 5! Professional was just one of the words I would use for this event. The Festival committee members Lizzie Harwood, Elizabeth Clark Wessel, Sandra Carpenter, Adnan Mahmutovic, Cassie Gonzales and especially the brain child behind this amazing endeavour, Catherine Pettersson have done a fantastic job. Their modest goal of selling 100 tickets was more than met and as I looked out on the auditorium filled with people who all seemed to really want to be there, all I could think was that here in Stockholm, Sweden, a place where English is almost a second language, holding a writers festival for writers who write in English was something that was long overdue. 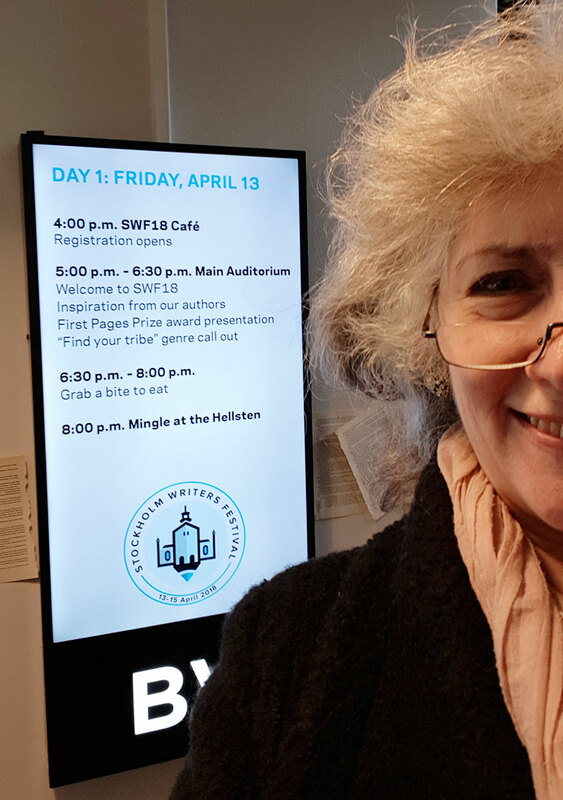 I am so glad I could be part of this whole event, both as contributor and attendee and I am really looking forward to coming again next year. And next year I will take a picture of each new person I talk to while they are holding their name tag! Just jump in, don’t wait, stop procrastinating. So now I start. I admit to being a bit intimidated. I just spent a whole evening working to redo how the header on this blog looks. I started out by picking out a “theme” I kinda liked and then my son set up the blog site on our own website. But the theme was just a begining for me. I had to put my own stamp on it before I could start to write. It wasnt really procrastination. I had to make it my own. Making images is where I feel most comfortable. Putting words to paper or in this case, to screen, is something “Writers” do. Im an artist, not a writer. Something I decided long ago – when I got my first journal and started to write down my thoughts in it. I was about 15 then. I didnt realize back then that being an artist didnt have to exclude being a writer. One person can be creative in many ways. Now I feel like Im commiting myself to start a new way. Here goes.